Recipe adapted from America's Test Kitchen. [Recipe makes (1) double crust]. We now have four days left on the Thanksgiving countdown. If you're in charge of making dessert this year, this means that time is running out to master the art of making the perfect pie dough. If you're like most people though, the thought alone of making, rolling, and shaping pie dough stresses you out. 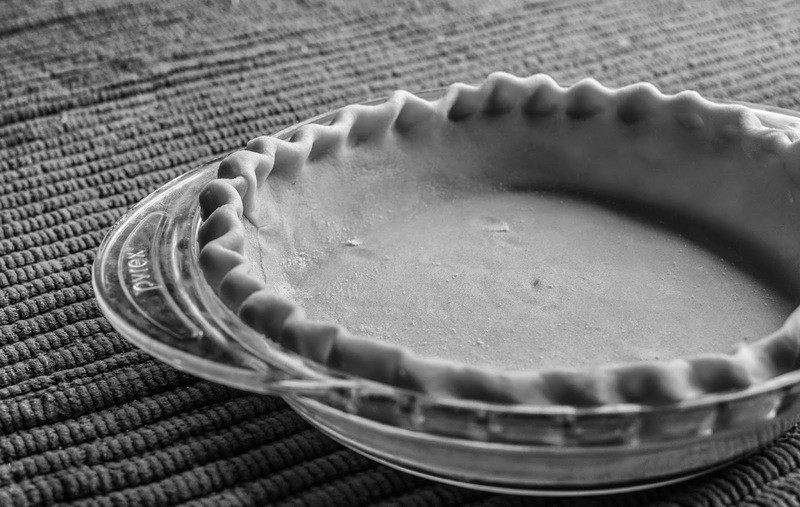 Many recipes yield a dough that's so dry that once you get it rolled out to the proper size, it cracks and falls apart while being transferred to a pie dish or while shaping it into place. After reforming it into a ball and working in a little water to moisten the dough, the final product usually is a tough mess since it has been overworked. Luckily some smart folks devoted to the art of making the perfect pie dough have found the key ingredient: vodka! It may sound weird, but it makes perfect sense. The main reason why this unlikely ingredient improves the dough is that it doesn't produce nearly as much gluten as water does (since vodka is only 60% water). Other tricks that America's Test Kitchen came up with include (1) using shortening in addition to butter as well as (2) using more fats than usual. The shortening does not contribute to gluten development since it doesn't contain any water, and the additional fat helps coat more of the flour, thus, preventing it from coming into contact with the water (which...you guessed it...produces gluten). By combining these tips with a solid base recipe, you'll now be able to enjoy the art of pie-making. In a food processor, combine (roughly) half of the flour with all of the sugar and salt. Add the chilled butter and shortening and process for 10 seconds. Add the remaining flour and pulse 4 to 6 times. Transfer the mixture to a medium bowl. Add the chilled vodka and water and stir with a rubber spatula until combined. [Side note: The dough will be wetter than typical for a pie dough; don't worry! When it's time to roll the dough, you'll use up to 1/4 cup of additional flour to prevent any sticking]. Divide the dough in half, and form each half into a 4-inch round disk. Wrap each disk in plastic wrap and chill in the refrigerator for at least an hour before rolling. [Side note: At this point, the dough can either stay in the refrigerator for up to 2 days, or can be frozen for up to 1 month].